When you purchase coffee, what factors influence your buying decision? Brand recognition? Flavor? Price? 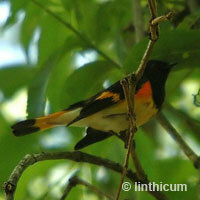 Saving migratory Songbird habitats? Learn how drinking coffee grown in the shade gives rise to a sunny outlook for native and migratory birds in Latin America. Your morning coffee might seem like a simple beverage, but in fact it is an opportunity for you to assist in maintaining or even increasing bird populations. That might seem like a tall order, but not when you realize that Americans consume one-third of the world's coffee. We have a good number of coffee drinkers for sure. If you are a coffee drinker or purchase coffee products, you should know what is happening in coffee producing countries. Two-thirds of the world’s coffee is produced in the Americas (Latin America and the Caribbean). These are also some of the areas with the highest deforestation rates in the world. 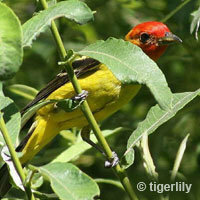 Audubon reports scientists believe only 10 percent of original forests will remain by the year 2025 . 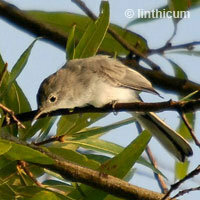 Many migratory songbirds have turned to coffee plantations for their winter homes. Native and migratory birds are choosing not just any coffee plantations but those where the coffee plants grow under a canopy of native and diverse trees. 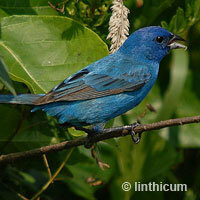 Birds there live off nectar and seeds from flowering trees as well as insects also living on the plantation. Every day those plantations are threatened by the more profitable sun-grown farming techniques. 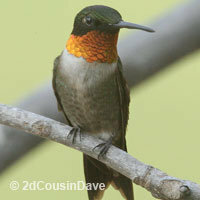 Audubon reports that America boasts 71 million bird watchers; THAT is some buying power. We certainly have a voice to make a change. Learn how you can make a difference. 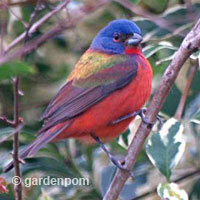 This article serves only as a brief introduction to what is happening in the winter homes of our summertime birds. Be sure to visit the links at the end of the article for more reading. In the Western Hemisphere, Coffea arabica is the coffee plant of choice. There are a number of cultivars of this species, each with varying degrees of coffee bean quality, production and disease resistance. Generally grown as a bush for ease of harvest, it is a shade-loving small understory tree. The area located between the Tropic of Cancer and Tropic of Capricorn is termed the “Coffee Belt” and offers ideal conditions for this tropical plant. Higher elevations with rich porous soil and plentiful rainfall and humidity provide the best conditions for coffee. Coffea arabica takes about three to five years to yield fruit. 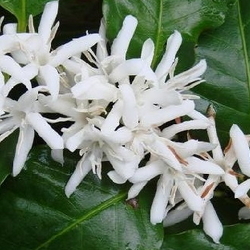 Once a year in most coffee-producing countries, the plant produces white blossoms with a jasmine-like fragrance. From this bloom the fruit is set in about nine months. The drupes are referred to as “cherries” and ripen to a bright red. 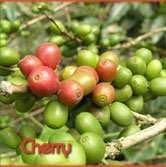 Coffee cherries do not ripen at the same time; ripe cherries are ready to be hand picked every eight to 10 days . Cherries are either picked as they ripen or all at once whether fully ripe or not. Ripe cherries produce a better tasting bean. Inside the harvested cherry are two seeds — what we know as coffee beans — which proceed to processing. Mother Nature placed the coffee bush in a natural, biologically diverse forest setting. In these small shade plantations an abundance of plant life and wildlife keep coffee plants in good health and create long-lived plants. Plant Life — Taller trees in shade plantations protect coffee plants while providing weed and erosion control. Multi-cropping and other nitrogen-fixing vegetation also help to provide organic material, eliminating the need for synthetic fertilizers. Coffee plants that grow amongst diverse vegetation are also less susceptible to pests . Birds — In a shade plantation, birds are drawn to the forest-like setting and keep coffee pests in check. Butterflies/Beneficial Insects — Several butterflies host on the coffee plant, and help pollinate the flowers. 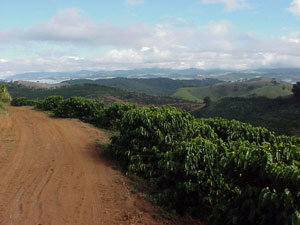 Coffee plants in this environment take longer to mature and produce smaller and fewer cherries. Most cultivars grown in shade are older varieties (Coffea arabica 'Bourbon' and Coffea arabica 'Typica') and are reported to provide a more flavorful bean . Additional hybrids are also grown in shade farms and cherries harvested by hand as they ripen. In the 1960s and 1970s, coffee growers began converting their shade plantations to sun coffee farms. 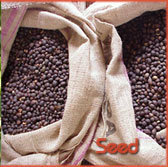 This resulted in new "technified" coffee, or modernization of coffee, replacing older cultivars with newer varieties. These new cultivars are bred to produce greater yields, grow in the sun, and are more resistant to coffee rust. Modernization also includes removing most or all of the shade trees in coffee farms. 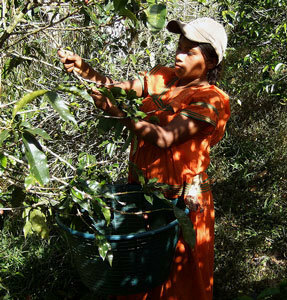 Over half of the traditional shade coffee farms in Latin America have been modernized . Growing these plants in the sun required some sacrifices. Cultivation Drawbacks — For successful sun coffee conservation, the widespread use of agrochemicals was established. Lacking any other vegetation to produce organic material, the farms require the use of synthetic fertilizers to keep the plants productive. In addition, plenty of pesticides are used to keep the plants healthy. As with many monocultures, the use of such chemicals contributes to the crop's shorter life. Sun farms also lack proper erosion control, proving problematic during periods of rain. Water erodes the soil and also carries off much of the agrochemicals in use. These chemicals contaminate local water supplies, presenting health and ecologic concerns . Many of the new cultivars such as the dwarf Coffea arabica 'Caturra' are highly susceptible to coffee leaf rust, a serious fungus. Habitat Destruction — While the sun farms themselves are less healthy, the large picture is the destruction of habitat in the past 30 to 40 years. 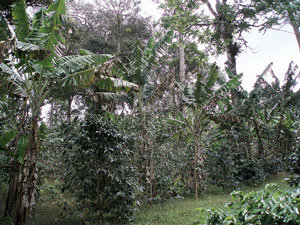 Trees and other vegetation were cleared or thinned, allowing room for more coffee plants. This practice is a devastating loss to the ecosystem. 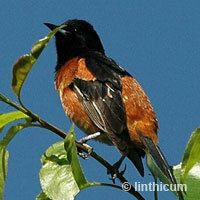 The losses include migratory and native birds, mammals, insects, reptiles, amphibians and many tree and plant species. The Natural Resources Defense Council states "Deforestation trends are serious throughout the coffee-producing lands of Latin America. Seven of the ten countries in the world with the highest deforestation rates are in Latin America and the Caribbean…" With this trend, shade coffee plantations are often the last intact forests in the region. 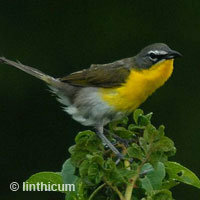 Widespread deforestation in Latin American and Caribbean countries has left migratory and native birds searching for acceptable habitats and relocating to shade plantations. 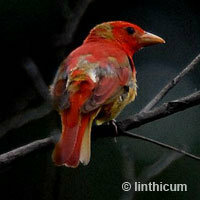 Nearly 120 species of migratory songbirds pass through or winter in Latin America. Studies in Mexico and Colombia indicate that there are 90 percent fewer bird species within sun plantations than in shaded . It is clear that where biodiversity is concerned, shade-grown coffee farms must continue in an effort to promote biodiversity. It is understandable that small plantation coffee farmers strive to make enough money to feed their families and stay in production. Even with Fair Trade coffee, farming families often are pressured to give up the generations-old practice of shade coffee farming. A movement is underway to protect the current ecosystems found in traditionally farmed coffee plantations by funding research and offering farmer incentives and education. Shade farm supporters remind us that additional crops such as bananas, citrus, lumber, firewood, and medicines may be harvested from shade plantations, bringing in more income for farmers. There are a number of different shade farm management styles, some offering rare species or precious hardwoods harvested with no damage to coffee crops. 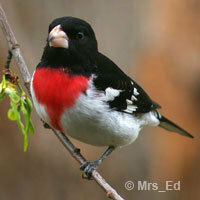 "Cause Coffees" as termed by Coffee Review, give consumers a voice in supporting songbird-friendly coffee. International groups like the Rainforest Alliance promote other causes including Fair-Trade (guaranteeing farmers a livable income), organic production and sustainability. The Smithsonian Migratory Bird Center is an advocate for migratory birds, offering certification on 100% organic shade-grown coffee. 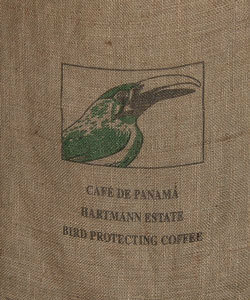 Coffee-drinking bird enthusiasts should look for coffee carrying the Rainforest Alliance and the Smithsonian Bird Friendly® certification seals. Conservation International and Starbucks have teamed up to plant trees in coffee plantations in Mexico as a part of Starbucks "Corporate Social Responsibility." Audubon Coffee uses an organic shade-grown roast supplied from the Rogers Family Company. The Northwest Shade Coffee Campaign is a conservation campaign from Seattle's Audubon Society chapter. Their site offers education, coffee purchases and opportunities to volunteer. The "big four," representing more than 40 percent of the world’s coffee are Nestle, Proctor and Gamble, Kraft Foods, and Sara Lee. Some of these companies are just now developing specialty coffees that address various fair trade and environmental issues. Chances are you are not going to walk into your local grocery store and find that your usual coffee brand is shade grown or carries any of these certifications. Many coffees from "the big four" coffee sellers are either Coffea robusta (a more bitter coffee grown at lower elevations), or blends of beans whose whereabouts often cannot be confirmed. 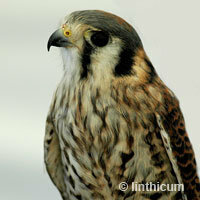 Coffee & Conservation website is a treasury of information from Julie Craves. Her articles keep readers up-to-date on latest happenings regarding sustainable coffee and diverse habitats. The home page also provides a rotating list of "Responsible Roasters" for readers ready to get involved. There is a great deal to learn about sustainable coffee. Some managment styles of shade plantations are not as diverse in tree species as others. It is often difficult to discern which companies are using farms diverse in tree species. Once coffee drinkers and bird lovers are aware of the connection between cheaper sun-grown coffee and loss of rich ecosystems, they may take action. The voices and buying power of 71 million American bird lovers (whether coffee drinkers or not) surely will have a loud voice in the market, ensuring many more years of backyard bird watching over their morning cup of coffee. "Coffee, Conservation, and Commerce in the Western Hemisphere" Robert A. Rice, Smithsonian Migratory Bird Center; Justin R. Ward, Natural Resources Defense Council. 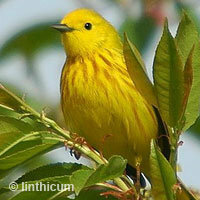 White paper from the Natural Resources Defense Council and Smithsonian Migratory Bird Center. 1996. Coffee & Conservation website is a treasury of information from Julie Craves. Her articles keep readers up-to-date on latest happenings regarding sustainable coffee and biodiverse habitats. 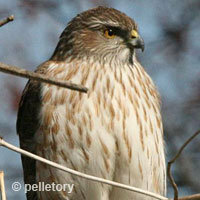 For a more complete look at this issue, please read this excellent article from Audubon Magazine. Many thanks to Julie Craves from Coffee & Conservation for permission to use photos as well as providing guidance for this article. 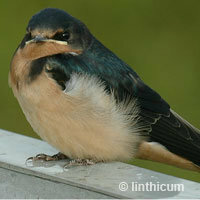 Bird photos supplied by bird lovers who participate in the Dave's Garden Bird Watching Forum, available to all Dave's Garden members. 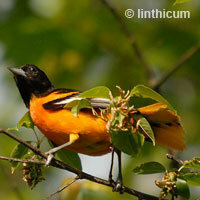 Thanks to "linthicum," "pelletory," "gardenpom," "2dCousinDave" and "tigerlily." 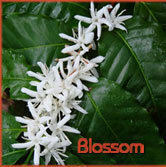 Thanks also to Dave's Garden member "floridian" for contributing the wonderful coffee blossom photo to PlantFiles. 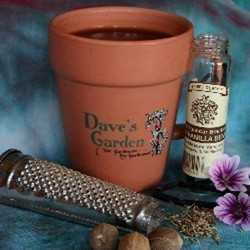 Today is day six of the Dave's Garden focus on coffee. Be sure and read the other articles leading up to National Coffee Day, September 29. I am one of those fortunate individuals who grew up on rural land that has been in my family for decades. 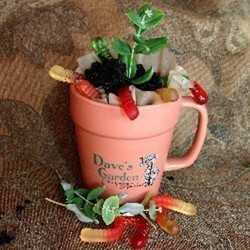 My parents and grandparents were avid gardeners who gladly shared their love of gardening with me. Today I enjoy a small yard in town with my husband, two dogs and a cat who is in charge of us all.